A tamper is used when brewing espresso, either in a machine or a stovetop espresso maker. This small tool is essential for packing the coffee grounds so you get the best shot of espresso possible. It's not difficult to use, but there is a proper technique and a few styles of tampers to choose from. Tampers are tools used to pack (or "tamp") espresso grounds into the basket of an espresso machine. The purpose of a tamper is to pack the grounds evenly for a quality shot. Essentially, you're taking it from a loose pile of 'dosed' grounds to a tightly compressed cake inside the basket. Tamping has a very specific purpose and baristas put a lot of effort into perfecting their tamp. Beyond the grind and the timing, proper tamping is key to pulling a quality shot of espresso. There's a science behind tamping. When pulling a shot, pressurized water is sent through the portafilter and into the coffee ground-filled basket. If those grounds are left in a loose pile, the water shoots right through them, often finding cracks or the easiest route possible and avoiding more difficult sections. This is far from ideal for picking up the full flavor of the coffee beans. When the coffee grounds are tamped, the water needs to force its way through the pile. This means that the water is interacting with the coffee longer and running through the entire cake of grounds. This combination of time and distribution results in a fuller flavor for the espresso shot. In a nutshell, the goal of tamping is to make it harder for the water to rush through the grounds. Tamping also compacts the grounds enough to leave a little room for the coffee to swell as water is added. This is a secondary purpose though it does help keep your machine's group head clean. A good tamper is made from lightweight metal and matches the size of the basket and portafilter you are tamping. If you have more than one basket, you may need more than one tamper or you can use a two-sided tamper. There is some debate over whether rounded (convex) or flat-bottomed tampers are better. In general, though, tampers come in four basic styles. Dual-Head Tamper - This tool looks like lopsided dumbells with two flat ends, one of which is a little smaller than the other. It is good if you have multiple baskets and great for the home barista. Handle Tamper - These tampers resemble an old-fashioned rubber stamp with a flat or convex bottom and round knob handle. The knob materials range from metal to wood (and some very nice woods). These allow you to add more force to the tamp and are preferred by professional baristas. Weight-Calibrated Tamper - This is an option that often comes with the handle tampers. You can purchase a tamper designed to give a specific force behind the tamp. 30-pound force feedback is standard though they are available in other weights. Puck Tamper - Some baristas prefer the style of tamper that looks like a hockey puck. These are flat and you grip them more like your holding a ball. If you pull a lot of espresso shots, finding the right tamper for you is very important. 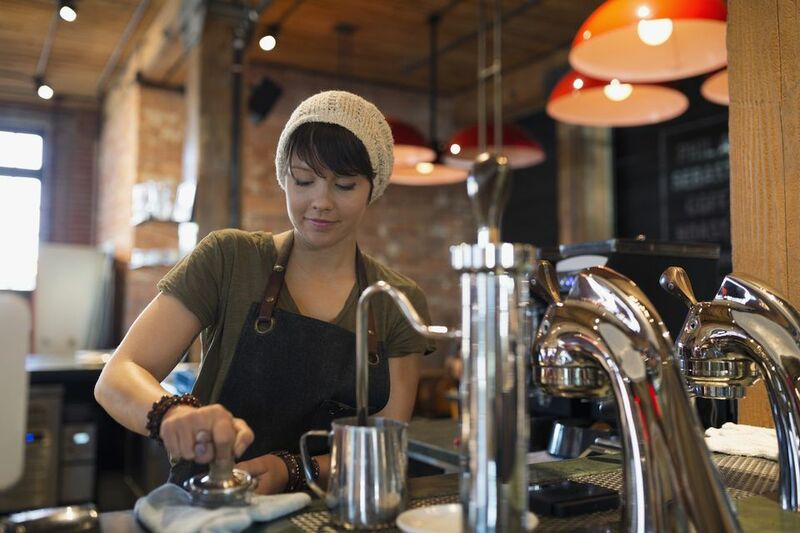 Professional baristas have been known to get pains and strains in their hand and wrist from tamping too much. Sometimes the remedy is as simple as choosing a tamper of a different weight, force, or style. The diameter of tampers varies and most fall into the 51-59mm diameter range. Be sure to choose one that fits your baskets. Expect to spend $30 or more on a high-quality tamper. For casual use, a dual-head tamper can be found for around $10. Some automatic espresso machines include a built-in tamper. In many cases, they are an arm extension that hangs off the side. This is less than ideal for getting the correct force needed for a proper tamp. For the best results, consider purchasing a separate tamper.